Nothing says ‘timeless beauty’ like a long white prom gown, and don’t they know it! Gabrielle Union, Beyoncé, and Lottie Moss all chose to grace their proms with a white dress appearance, each of them taking their own unique slant on this classic choice. 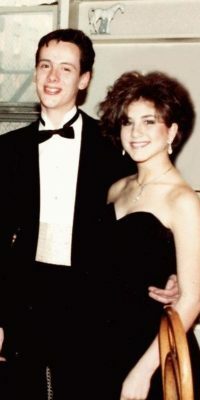 Though Gabrielle’s hairstyle and prom corsage may give away an 80’s vibe, the asymmetric hemline of her prom dress is still a popular choice that has stood the test of time. Beyoncé’s white prom gown adds a truly unique twist to a timeless classic, with beautiful cut-out detailing and a tasteful thigh-high side split to show off her amazing legs. And we absolutely love that Lottie Moss went for an off-shoulder white gown, which is so on trend at the moment. You can recreate her look with our favourite timeless white prom dress, this Bardot style Pia Michi dress which features a beautiful embellished waistband. A floor length red prom dress declares confidence and charisma to the world, that’s why it’s the go-to choice for big personalities like Britney Spears, Demi Lovato, and Dinah Jane (of Fifth Harmony). Britney showed off her sparkle with delicate embellishment to the bodice of her fitted gown, whereas Demi opted for a stylish wrap dress – they are both positively glowing! Dinah Jane looks far more stunning than anyone at prom ever should, giving off Spanish señorita vibes in her gorgeous red mermaid dress, complete with layer upon layer of ruffles. If you’re dreaming of a daring scarlet prom dress like Dinah’s, look no further than this Pia Michi red dress with elegant ruffles and a beautiful lower back bow. Let’s face it, prom is the one night of the year when you can dress like the princess you truly are. And what’s a princess without her embellished dress? Blake Lively went full Disney with her sparkly pink prom dress, reminiscent of Sleeping Beauty’s ball gown – complete with tiara of course! Jessica Alba is giving us serious Snow White vibes in her prom picture as she chose to wear a prom gown embellished with delicate white flowers. Bella Thorne paired her turquoise prom dress so perfectly with gold accessories and embellishments that even princess Jasmine would be envious. You deserve to look and feel like a princess at your prom, that’s why we’d recommend our favourite princess style prom dress, this turquoise Sherri Hill gown. With such a stunning encrusted top, open back and full tulle skirt, you’ll be twirling all night long. Don’t lose your glass slipper! The Classic Black Dress: Jennifer Aniston, Delilah Belle Hamlin, and Tyra Banks. What’s classier than wearing a sleek black prom dress? The great thing about this classic look is that you can play it in any way you like. Jennifer Aniston went for a cute, fun style when wearing her strapless black dress with a sweetheart neckline. Delilah Bell Hamlin (daughter of actors Lisa Rinna and Harry Hamlin) obviously learnt a lot about style when growing up around the stars of The Real Housewives of Beverly Hills. As we can see, she took a very high-fashion approach to wearing her off the shoulder, floor length black prom gown. Tyra Banks went for straight-up killer in her prom picture, fashioning a slinky black dress with a plunging neckline – would we ever expect anything less from the supermodel? Our personal favourite take on the classic black prom dress is this exclusive floor length black Sherri Hill dress with a stunning lace bodice and beaded detailing. Finally, there’s no better colour fit for a prom queen than a deep royal blue, as demonstrated in the celebrity prom photos of these beautiful ladies: Caroline Sunshine (Disney Channel actress), Ariel Winter (of Modern Family), and Rihanna. 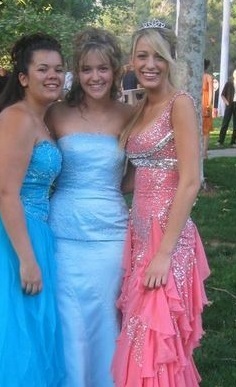 Caroline Sunshine went for an elegantly simple, fitted blue gown with intricate lace detailing on the sleeves. 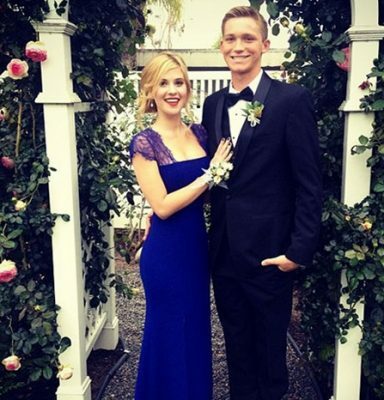 Whereas Ariel chose to go for lace detailing all over in her stunning navy-blue prom dress. 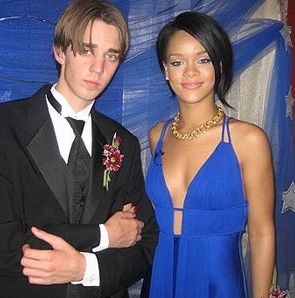 Her highness Rihanna chose to join her (rather awkward) prom date in a beautiful blue number – we love the unique and daring neckline of this dress so much! Our royal blue recommendation for a prom dress worthy of the crown, is this Pia Michi gown with plunging neckline and delicate embroidery detail. We hope you’ve had as much fun as we have looking through these throwback celebrity prom dress pictures. If you’ve been inspired to select one of these beautiful prom dress styles for your own special night, and you’re looking for the best prom dress boutique, you’re in the right place! You can browse all of our prom dresses here, and don’t forget to contact us if you have any questions or need guidance – we would always be happy to hear from you. This entry was posted in Prom Dresses. Bookmark the permalink.